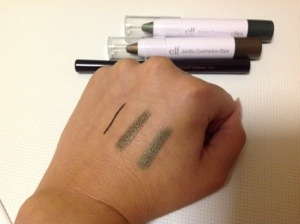 I heard a few things about ELF (Eyes Lips Face) products, and I wanted to try them myself. Therefor I went on the internet and got to their website (website…) and ordered some products. I got 6 products for a total of 13 euros (around 10 dollar). I wanted some different products to try because I haven’t tried any of them. I got a bronzer, an eyeliner, a lip gloss stick, 2 eyeshadow sticks and a regular eyeshadow palette. They got a few different ranges in which their products vary from content and price. They have a studio line which is their more professional line. They have a mineral line which uses more natural mineral products. And last they have an essentials line which has essential items in it and contains their cheapest products. When I say cheap, it doesn’t mean that they are cheap products in the sense that they are bad, they just don’t cost that much. A lot of those products range between 1 to 3 euros/dollars. I will tell you about my experience with the products I ordered. This bronzer is from their studio line and has 4 shades in it. When I ordered it I was so thrilled to try it out because it looked like a really nice product. The packaging looks very luxurious. But I have to say that I was a bit disappointed when I tried it. It has a shimmer in it which I don’t like. I have an oily to combination skin and I don’t want to use shimmer on my face. When I buy a bronzer, I want to be able to use it all over my face, not just for contouring. I find that it is a bit difficult to do that with this product because of the shimmer. If it weren’t for the shimmer, it would have been a very nice product for it’s price. Normally I don’t use a liquid liner. But I heard so much people talking about it, I wanted to try it out. I didn’t feel like spending a ton of money on it, so I tried the ELF essential waterproof eyeliner pen for 1€ (2$). I like this product, especially because it is so cheap, but it works good. It has a felt tip, which makes it a bit easier to apply than another liquid liner which has a brush. It is easy to use, it stays on for quite long. I didn’t get the chance to really test if it is waterproof, so I can’t say if it is a success in that area. But I like the product, and I would buy it again, you can’t go wrong for that price. I also tried the Essential jumbo lip gloss stick. Again, I heard so much people talk about different brands that has those lip pencils. And because I saw that ELF had them as well, I thought I give it a try. I really like this product. When you swatch it on your hand, it doesn’t look like it has an intense color, but the color payoff is quite nice on my lips. I do notice that they are darker and more red (which is the color I chose). They go on easily and they are not sticky. I do have to say that I use a clear lip balm under it, because I have a feeling that it does dry out my lips a bit, but I have very dry lips naturally, so that’s why I use an extra lip balm. But overall I am very pleased with this product. 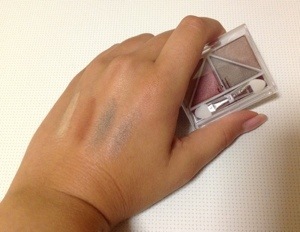 In the same trend as the last product, such sticks are also found for eyeshadow. A lot of brands have these eyeshadow sticks in their lines and I wanted to give these a try. I saw 2 colors that I liked and I couldn’t decide which one to take, so I ordered both. They do come in a few colors, but I wanted to try them in more darker colors, so I have a dark green and dark brown one. They have a bit of shimmer in them, but they don’t like glittery. They just have a shine to them. They are creamy, really pigmented and they blend easy. I like them to use in my outer corner and blend them into my crease. I really enjoy using these. This is like a mini eyeshadow palette. And with mini, I mean it is really small. It contains 4 colors. 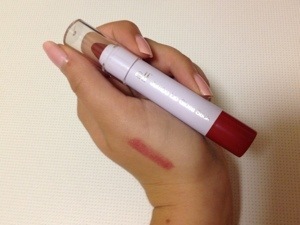 Mine is in the shade Luxe and has one light beige color, a red/bordeaux color, a green/kaki color and a brown color. The pigmentation depends on the color. Some colors are more pigmented and others you have to put on more to see the color. I bought it mainly for the red/bordeaux color, because it’s a color I don’t have and never tried yet. But it doesn’t really come across like you see it in the packaging. I’m not to impressed with this product to be honest. I think you can get better palettes with a few colors for just a little bit more money, but still under 5€/5$. Pro’s ordering ELF products: the products are very cheap and most of them are of decent quality. When you order online from their website, you get your order within 2 days. Cons ordering ELF products: personally I think that their shipping costs are a bit high, especially because their products are so cheap. I wouldn’t order just 1 or 2 products because their shipping costs are around 7€ and that way you pay more shipping costs than product. Other then that I really like it. For the price you can’t go to wrong, but it is possible that there are some products you won’t like. I will definitely order from them again, when I have found a few products I want to try. 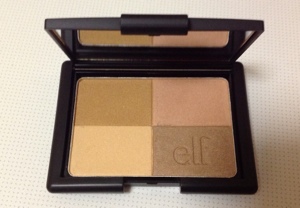 Have you tried any ELF products? Which ones and did you like them? This entry was posted in beauty and tagged elf, eyes lips face, Product review by missnathaliexo. Bookmark the permalink.